When a friend or a loved one has a bundle of joy on their way, it is your responsibility as a friend, cousin or sister to help them welcome motherhood in style. Most people tend to do so by organizing baby shower parties for them. However, lack of proper planning can make the people gathered bored. It is, therefore, best to plan ahead and incorporate entertaining activities such as games that can make the party fun, memorable and keep the guests entertained. Take time to find the best baby shower games and activities so that the guests can actually want to play them. Here are a few games that are great fun for a boy or girl baby shower. 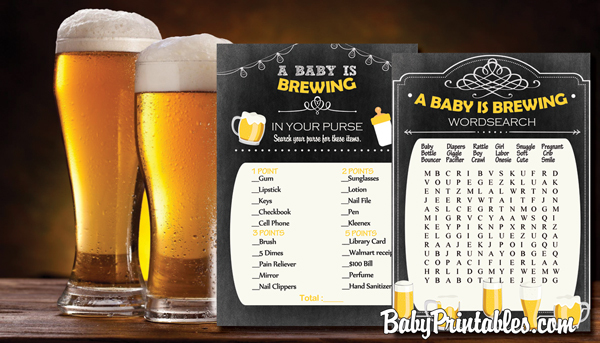 In this game, the baby shower planner provides the guests with the word searches, and they should look for the names written at the top of the sheet. It is one of the easiest and most self-explanatory games you can engage people in as it ensures that the guests at the baby shower become lively by making their brain active. To ensure that the guests all begin this game at the same time, flip the word searches over so that no one is ahead. When you are ready, cue them to begin and let them compete to finish. The first person to find all the names written at the top becomes the winner. The fun fact about this game is that the words they ought to find are baby related, so it keeps the activity within the theme of the party. Babies need a lot of stuff so prior to the baby shower; you can buy 10 to 12 baby items that the parents may need. Make a list of the things you bought on one side and leave the area about the price blank. The game evaluates who is the best at guessing the cost of the items. Gather the guests on an actual day and ask them to guess and write down the prices of each item on the list as well as the total. The person whose total is closest to the actual price becomes the winner. The best part of this game is that the parents-to-be get to keep the baby items used for the game, and they may come in handy. The game is an outstanding way to get everybody involved and to reveal some fun facts about the guests at the baby shower. Each player gets a card with lists of items categorized into different parts with different points for each group. They then search through the purse for the items listed on the card and calculate the corresponding points. Though this game may leave some of the guests red-faced, it allows them to interact in a relaxing way. The winner is the person with the highest number of points. Before the actual day of the baby shower, print a sheet of paper with the letters of the alphabet while leaving space to write down something. Provide the guests with these sheets when you want to engage them in the game. Ask them to write down any names they have in mind beginning with each alphabetical letter. The first person to finish jotting down names for all the alphabetic letters becomes the winner. The advantage of this game is that if the parents-to-be had not settled on a name for their unborn baby, they now have numerous options to pick from. Baby shower word scramble is another fun way to interact and actively involve the visitors. It has the guests racing to unscramble the words, and this makes the environment lively and friendly. 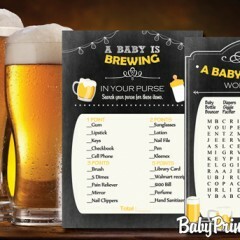 When planning the party, you can look for scrambled words games that relate to the baby or the pregnancy. In doing so, you will have the attendees competing to see who will unscramble these words first. You can find these printable games in multiple designs and colors in order to coordinate with your baby shower theme. To add a unique twist to the baby shower party, you can add prizes for the winners. Some of the items you can pick include picture frames, bracelets, gift cards, nail files or coffee mugs. With these ideas in mind, it is time to get planning. Remember to pick games that suit the crowd and the themes. For example, if it’s a ladies only bridal shower, pick games that will excite the ladies and if there will be men; choose games that they can participate in so that they are not left out. As a baby shower hostess, you can alter the rules of the game so that they are suitable for the party as well as the guests. The games mentioned above are super easy to assemble, just print on 110lb cardstock paper and cut out the sheets. Click on the link if you’re looking for more baby shower game ideas.